Occasionally I see a saying that seems to bring a moment of enlightenment, but the more I see it, the murkier its truth becomes. 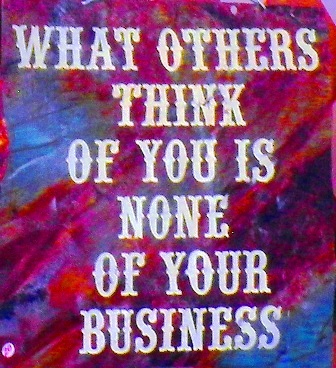 And so it is with this little gem: What others think of you is none of your business. What a child thinks of his parents is often a key to his emotional health, so what the child thinks of his parents is definitely the parents’ business. If the child is overly attached to his parents or is angry at them for no apparent reason, the child could be having emotional problems. On the other hand, if the child is embarrassed by his parents (beyond normal bounds) or if the child finds it hard to be around them for some reason, maybe the parents are the ones with the problem. If you are in a romantic relationship, a marriage, or some other long-term coupling, what your loved one thinks of you is definitely your business. If you think yours is a love match and the other thinks it’s a lust match, you need to know that so you can make informed decisions about your future. If your husband no longer loves you and has developed a roving eye, you certainly need to know how he feels about you so you take appropriate actions, such as getting couple’s therapy. (Unless, of course, you prefer not knowing.) If you’re in a relationship and are ready “for the next level” (whatever that is), and your partner in the relationship wants only your money, you need to know the truth before things go to far. And of course, if your neighbor hates you enough to want to kill you, that most certainly is your business. There must be many other examples where this particular saying doesn’t pertain, but you get the point: sometimes a clever message is simply clever and not a great truth. I think every outcast in a small town where the people are pressured to conform to a certain standard (like perhaps being a good fundamentalist Christian) should see that saying. It’ll help them feel less like an outcast and more like an individual. I have a book that is now out of print. It is called “What you think of me is none of my business”. It is a great book in that it reminds us that what someone else thinks of us is really only about what they think of themselves and project onto us. If what what people think of others isn’t their business, then what’s the point of ever loving anyone or being loved? I look forward to living some day in a small town where everyone knows everyone. Where I live right now no one knows anyone and it is easy to feel lost. I often pretend to not care what others think of me. But I don’t fool myself. I care. Sometimes too much. However, what I’ve learned is to pick and choose carefully people that I do care about what they think. Otherwise it becomes complicated and I spend entirely too much energy WASTED energy on wondering why this person or that person thinks what they think. After they were kind enough to share with me their thoughts. Then I guess it somewhat becomes my business. Or at least they wanted it to become my business. Its usually negative thoughts about me they share. To “consider the source” is something I struggle with. I force myself to have an internal dialog and tell myself, “they are not going to impact my day!” It doesn’t work as often as I need it to, but I work at it. If a person is important in your life, it’s natural to care what they think. If they’re not important, it shouldn’t matter, though it often does. It’s something we all struggle with. Thank you for your contribution to this discussion. You’ve given me much to think about. Yes, if the person is important, we do care what they think. Perhaps that is the really the first thing to consider…deciding IF the person is important. If so, we care. If not we shouldn’t.